A win over the University of Scranton Royals in Scranton was an impressive feat for the men’s basketball team at the Catholic University of America. On Saturday, January 16th, the seniors on the team earned a win they had not enjoyed in their careers at Catholic. It was another battle against a well-known rival opponent, but the Cardinals left the Electric City as victors in a 73-62 win. The visitors dominated the first half and jumped out to a 19 point lead at the end of the first half, but the Royals provided a response to make the game interesting in the second stanza. 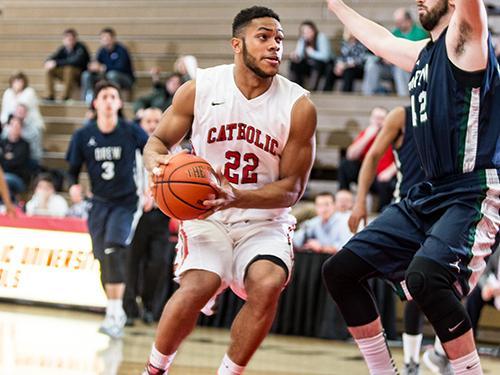 The run was not enough, however, and CUA held on to a nine point victory. Catholic’s current record stands at 12-5 overall and their Landmark record is 5-3. The shots were falling for both teams on the evening, as Catholic and Scranton shot better than 47% from the field and 46% from behind the 3-point line. A look at the statistics show a very evenly matched contest, the only advantage going to CUA for knocking down five more 3-pointers than their rival. The 10 players who stepped onto the court to start were interestingly the ones who contributed all but two points in the entire game. Senior center Austin Calling was the only non-starter from either team to find the basket all evening. Four of the five starters from head coach Steve Howe’s lineup scored in the double digits. Corey Stanford, Bryson Fonville, Andre Mitchell, and Kyle Phanord all contributed at least 12 points, while Jay Howard dealt with foul trouble all game and finished with 6 points. Scranton’s Brendan Boken dropped an impressive 32 points on 15-18 shooting, but only two other players scored 10 points for the Royals. Senior All-American guard Fonville set the benchmark for the team, adding 21 points, 9 assists, and four steals. Junior forward Stanford came just short of a double-double, chipping in 16 points (including four 3-pointers) and 9 rebounds of his own. Mitchell scored 16 as well, and Phanord matched Stanford’s four 3-pointers to end up with 12 in the game. Catholic shut down the Scranton offense by holding them to just 30% shooting in the first 20 minutes of the game. The 19-point lead was enough to buoy them and survive a late game charge. The clock showed all zeros and the Cardinals got an important conference victory. CUA was scheduled to host the United States Merchant Marine Academy, tomorrow, Saturday, January 23rd, but the oncoming snow storm has postponed the contest. The team will next be in action at the DuFour Center next Wednesday, January 27th against Susquehanna at 7 PM.